This tab is visible only if there are registered file associations for Viewer. See also command line options to repair broken file associations. This tab is also invisible for mobile mode. On this tab you can select a default action for bug-reports. I.e. 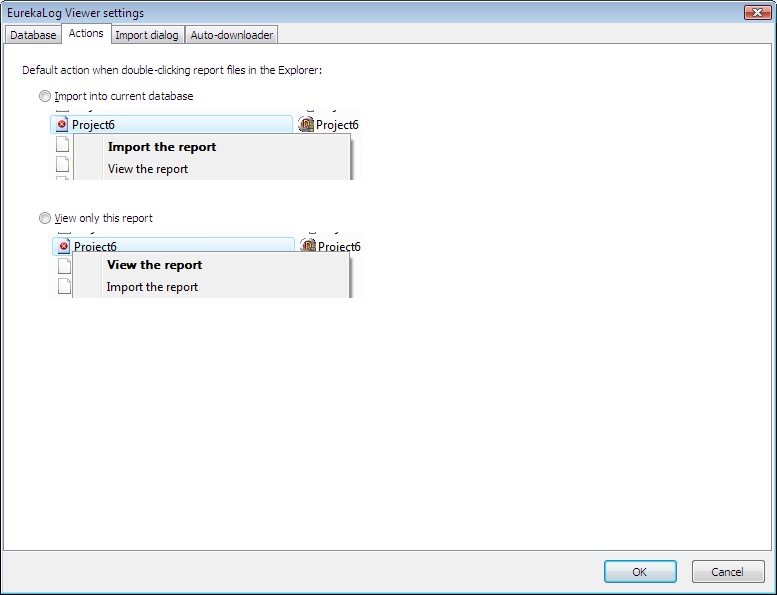 when you double-click on bug-report in Explorer's window it can be either imported to database or just viewed. See also: DB mode vs View mode. If you select "Import into current database" option then report will be imported in the active database. If you've set Viewer's mode to view only, then Viewer will switch to in-memory database mode. If you select "View only this report" option then report will be always viewed, even if you've set a specific database mode. The default mode is "View". Note, that this setting is per-user and it specifies only the default action (i.e. action on double-click on report's file). You can always right-click on file to call popup menu and select any other command. If Viewer needs to change its current mode (i.e. you are working in any database mode, but asking to view a report), then it will open a new instance, rather than change your settings. Your current's instance settings are never changed.